Torn Ranch Fanciful Mixed Dried Fruits Gift Pack...Simple, yet elegant. Hand packaged fresh to order...the finest dried fruits from California's lush, fertile valleys. 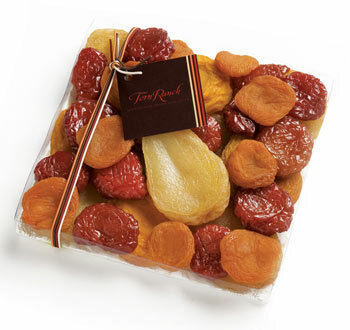 The Fanciful Mixed Dried Fruits gift pack includes: Peaches, jumbo pears, Turkish apricots, & ruby red plums. Fanciful dried fruits...the perfect healthy, nutritious gift for any occasion! Torn Ranch Fanciful Mixed Dried Fruit Collection.